I am a highschool student at Santa Rosa Academy in Menifee, CA, and my name is Joshua Smeraldi. I am doing a community service project where I am designing a t-shirt and making an educational promo flyer to both advertise and sell the shirt as well to provide facts about the devastating California wildfires and tips on wildfire prevention. I wanted to do this project as a way of honoring our local firefighters and the heroic efforts and sacrifice by many others during the horrific, historical fires we experienced here in California in 2018. The Holy Fire was just 11 miles from our house and my school was cancelled due to poor air quality during the time of this fire. My family has a long history of professional firefighting. My grandfather, Captain Frank J. Piazza, was a Lieutenant for many years at Ladder 7 in Meeting House Hill in Dorchester, MA, before working at BFD Headquarters on the Arson Squad and serving as head of the Underwater Recovery Team for the Boston Fire Department. My uncles Val G. Piazza (Engine 14), and Frank W. Piazza (Ladder 7) were also firefighters and proud members of the BFD. "Thanks for any help you may be able to offer me with my project. 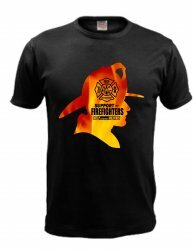 I truly hope it is successful and through the purchase of a shirt we can help to raise a lot of money to benefit our local firefighters through the Riverside County Firefighters Benevolent Fund." As with any 100% cotton T-Shirt, the sizes tend to run small so make sure to buy the right size as there are no returns or exchanges..
100% Cotton Short Sleeve Black T-Shirt Adult Unisex Sizes : S, M, L, XL, 2XL, 3XL, 4XL. Important Note: You must choose your size at the drop-down menu above. If you wish to purchase more than one T-shirt in different sizes, add the first to your shopping cart and return to this listing to add the next, and so on. Brand new, packed in a sealed bag. FREE standard shipping in the U.S.! Does not apply to orders containing additional items.